3 Multiple uses and style,meets different kids needs. Multi-purposes,suitable for bathrobe,homewear,housecoat and beach robe,etc.Hooded design protects head,ears and neck from the cold air. Adjustable belt can be adjusted according to the size of the child's body,two pockets design is easy to carry and store things. New arrived with the special unicorn design.Nice gift for your kid. Please check carefully the above size picture before you place an order. 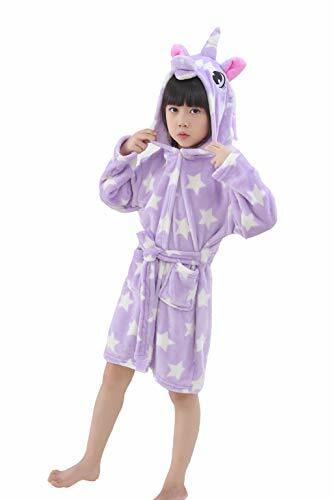 Super soft and comfortable:✔The 100% flannel robe is softer,more daruable.You won't regret to buy such a fantastic bathrobe for you kids.It's skin-friendly for the high quality flannel. Reasonable and unique design:✔The hood and the belt could protect your kids from bathing as much as possible.Well,the unicorn must be caught your eyes. A ideal gift for the kids:✔It's an absolutely perfect gift as a birthday,NewYear,Children's day gift to your kids.They will fall in love with it. Nice workmanship and good cutting and sewing: ✔The bathrobes are select by individually.You will be satisfied with the wonderful robe.New year,new robe,why not choose UsHigh? Economical price with nice after-sales service:✔Customer satisfaction is our top priority.If there is any questions,please contact us,we will answer you as soon as possible. If you have any questions about this product by UsHigh, contact us by completing and submitting the form below. If you are looking for a specif part number, please include it with your message.